The Gaza Strip’s dense population is composed predominately of refugees and their descendants who were violently displaced to make way for the Israeli state. Roughly eighty percent of the population are considered refugees by the UN, and live in refugee camps, as they have always been barred by Israel from returning to their homes and traditional lands, and denied any form of compensation to this day or even an apology. To make matters worse, the Gaza Strip has been subject to a total military blockade for eight years that has crippled the local economy, and exacerbated massive health and infrastructural crises. After Hamas was elected in a free and fair election, Israel imposed a blockade on the territory by land, air and sea (with Egypt enforcing the land blockade on Gaza’s western border). What this means in practice is that an entire civilian population of 1.8 million is prevented from exporting its goods, and has very minimal access to goods from abroad. Israel fully controls everything that is able to enter into Gaza, allowing Israel to monopolize, quite lucratively, the foreign market. According to a recent World Bank report— which describes Gaza’s economy as being on the “verge of collapse”— the blockade has created the world’s highest unemployment rate at 43%. The punishment that the Palestinians of Gaza have endured is incomprehensible. The need to lift the blockade has become even more urgent in the aftermath of Israel’s massive 2014 military assaults on the besieged territory. While it is impossible to fathom the degree of punishment suffered by civilians in Gaza, if the number killed just during the latest military assault were projected proportionally onto Canada’s population, it would amount to over 42,000 Canadians killed. And could we imagine if all of the hospitals in Canada able to treat geriatric patients were bombed? What about if all the power plants supplying electricity to Canadians were bombed, leaving our entire population with less than eight hours of electricity a day? Gaza’s water purification plants have been unable to function because of a lack of electricity, worsening Gaza’s access to potable water. 90-95% of water is unfit for consumption, and the World Health Organization has reported that if Israel’s policies towards Gaza continue, it will be uninhabitable by 2020. Despite Israel’s commitment to end its blockade of Gaza through ceasefire agreements signed with Hamas, the blockade has stayed in place, while international observers have concluded that Hamas has met its commitments under these agreements. Shamefully, Western governments like Canada have been unwilling to sanction Israel for this form of collective punishment, which is illegal under international law. In the absence of state pressures on Israel, human rights activists from around the world have been attempting to break the blockade through non-violent collective action. For the third time in five years, an international flotilla has set sail in an attempt to reach the shores of the occupied Gaza strip, in order to break the blockade. Israeli state piracy prevented the first flotilla from reaching Gaza’s shores, when Israeli commandos boarded the Mavi Marmara in international waters and murdered ten people. The second flotilla was thwarted by Israeli manoeuvres and a complicit Greek government, with most of the boats unable to leave Greek ports. This current flotilla has been more secretive in nature, and hopes to achieve its goal of reaching Gaza, where it will deliver solar panels and medical supplies, and will receive Palestinian goods to be sold abroad. 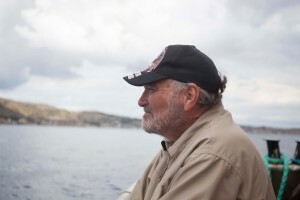 Bob Lovelace, Queen’s University professor and member of the Ardoch Algonquin First Nation, is aboard one of the boats. He believes in the power of human solidarity to bring much-needed hope to the people of Gaza. If we wish to learn from our own mistreatment of indigenous people in Canada, we would be wise to follow Bob’s lead in solidarity with Palestinians, and demand an end to the blockade now. Originally published to IJV’s Rabble.ca blog.